It may be raining outside, but that is no reason to not go out and enjoy the day! Your baby will be comfortable and dry beneath this transparent, wipe-clean plastic raincover. The raincover fits snuggly onto any Maxi-Cosi baby car seat including the Pebble Plus, Pebble and CabrioFix. Please note that your baby should not be in their car seat for longer than an hour and a half at a time. 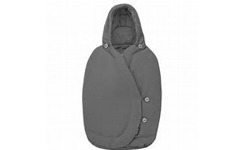 Keep your baby warm and snug in this fleece-lined, padded footmuff. Featuring a drawstring hood and an easy-access zip opening with closing buttons, this machine washable footmuff folds open to easily get your baby in and out. Available in wide range of colours that have been specially designed to perfectly match the colours of the Maxi-Cosi baby car seats. Protect your baby from those nasty mosquito bites with this lightweight and washable mosquito net. 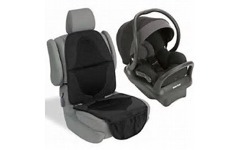 Easy to fit on all Maxi-Cosi baby car seats including the Pebble Plus, Pebble, CabrioFix and Citi. Simply fold and store in the basket of your Maxi-Cosi pushchair. Please note that your baby should not be in their car seat for longer than an hour and a half at a time. Journeys in the car can be very relaxing for children and often lead to spontaneous naps. The Sun Canopy shields your baby/toddler from the sun, providing a safer and cooler atmosphere for sleeping. 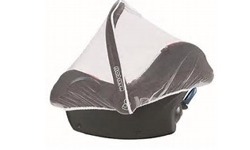 The Sun Canopy is easy to attach on all Maxi-Cosi car seats with a head support element (2wayPearl, Pearl, AxissFix Plus, Axiss, Tobi, Rubi XP, MiloFix and Opal), is washable and provides full UV sun protection. You can safely keep an eye on your rearward-facing baby/toddler thanks to the Maxi-Cosi Back Seat Car Mirror. 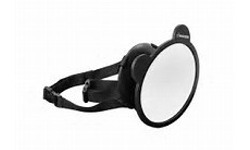 The mirror offers a wide angle view, can be easily and quickly installed by attaching the straps to the centre of an adjoining headrest and can be adjusted in any direction to ensure your baby/toddler is completely in sight. It has also been crash tested and approved for sturdiness. The Maxi-Cosi Back Seat Protector allows you to protect the rear seats of your vehicle from damage by the car seat/ISOFIX base or from dirt under your little one’s shoes when in a rear-facing position. 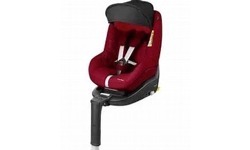 It is easy to install under any rearward or forward facing car seat and provides convenient access to the belt buckle or ISOFIX anchorage points. Its 6 anti-slip pads offer stability and will prevent the children car seat from moving out of place.